I am looking forward to watch this movie when it comes out next month. 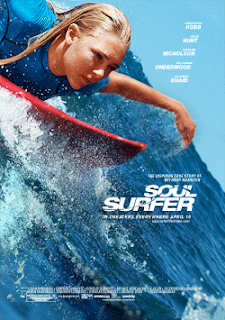 Soul Surfer /sohl serf-er/ – noun; 1. A term coined in the 1970s, used to describe a talented surfer who surfs for the sheer pleasure of it. Although they may still enter competitions, a Soul Surfer's motives go beyond winning. Bethany has become a source of inspiration to millions through her story of determination, faith and hope. Born into a family of surfers on February 8, 1990, Bethany jumped on the board at a young age. Bethany entered her first surf competition—winning both the short and long board divisions at age eight. On Halloween morning 2003, Bethany was attacked by a 14-foot tiger shark, which bit off her left arm and seemed to end her career as a rising surf star. After losing more than 60% of her blood and undergoing several surgeries, Bethany began her recovery with an unbelievably positive attitude. Miraculously, just one month after the attack, Bethany returned to the water. Two months later, Bethany placed fifth in the Open Women's division surf competition and just over a year after the attack she won her first National Title. In 2007, Bethany realized her dream and turned pro. Bethany has since participated in numerous Association of Surfing Professionals and World Tour Events with her major highlight being a second place finish in the ASP 2009 World Junior Championships. "It has been an incredible journey for me and now, I'm just so excited to share it!" says Bethany. "Bethany's story is so powerful," says Soul Surfer Director Sean McNamara. "Most people would have given up after what happened to her, but not only did she make an amazing return to surfing, she excelled at it, and has turned her life into an inspiration for people all around the world. She is someone you look at and think, 'If she can do all the incredible things she's done, I can set the world on fire, too.'" says Sean. Amazing! I'm excited to see the film! And excited to surf tuloy this Spring Break! Eeee!